This course is designed to give students a broad survey of the important issues in the study of comparative politics. We will gain an understanding of world politics and political systems and compare issues and structures on a global level. Students will conduct in-depth studies of individual countries and see how local issues have a worldwide impact and we will explore how politics works on individual, group, national, and global levels. Each country study will apply a theoretical framework to explore broad issues like why some countries modernize more quickly or why some are more democratic. Throughout the semester, students will gain knowledge of political institutions and processes and will learn to think critically about the consequences of public policies. 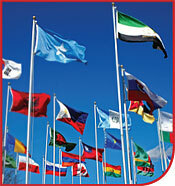 We will observe the international economy and how politics shapes a nation’s influence on the local and global levels. This course will help students learn about other countries, regions, and the world, and it will help them ask fundamental questions about politics and government.